An action TPP game developed by Japanese studio Omega Force (the creators of Dynasty Warriors and Samurai Warriors). Toukiden: The Age of Demons is set in a fantasy world inspired by Japanese mythology and history. 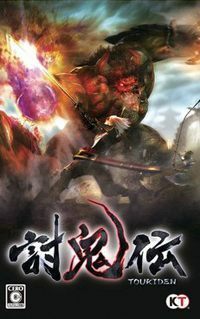 Toukiden: The Age of Demons for PSP and PSV is an action slasher TPP game created by a Japanese studio Omega Force. In many respects, it resembles other games from this developer, such as Dynasty Warriors and Samurai Warriors. The game takes place in a fantasy world (inspired by both the mythology and the history of Japan), which is being invaded by demons (the Oni) from the underworld. The story begins eight years after the start of the war known as the Awakening, and you play as one of the elite warriors called demon slayers (or simply the Slayers). The game is focused on the Utakata village, one of the last settlements of humanity. The story progresses as you explore the location and talk to the local NPCs, thus receiving quests to complete. You can also use the services offered in the village, such as a prayer in the temple, which gives you a chance to acquire a stat boost for the next battle. Fighting demons is the main task of the protagonist of Toukiden: The Age of Demons. The game utilizes a complex combat system, allowing for executing spectacular combo attacks. The boss fights are particularly notable, as you have to find a specific way to defeat such a huge opponent—often the method involves cuting off the boss' body parts, using what the game's creators called the Targeted Destruction System. Curiously, you can also use the TDS while fighting minor foes. The player character can be customized according to your playstyle. You can choose the weapon you like using the most (e.g. a sword or a bow), and upgrade your equipment at the local blacksmith's forge. The most important element, however, are the Mitama, which are the souls of heroes fallen in battle. The Mitama are used to enchant pieces of your equipment, thus giving them extraordinary attributes. Toukiden: The Age of Demons for PSP and PSV features 3D graphics, which look remarkably good, considering the capabilities of Sony's handheld consoles. The game also features a co-op mode, allowing for up to four players at the same time to team up and complete story missions together.